Vice President Joe Biden prodded Israel on Tuesday to halt the expansion of its settlements on the West Bank, a move he called a necessary step toward ending the decades-old Israeli-Palestinian conflict. Biden told the annual conference of the influential American Israel Public Affairs Committee that Israel’s new prime minister, Benjamin Netanyahu, has “important ideas” about the peace process. 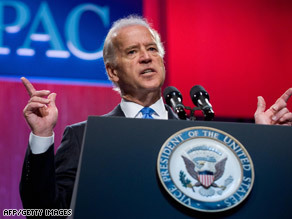 But he said, “This is a show-me deal, not based on faith.” Biden said, “Israel has to work toward a two-state solution. You’re not going to like my saying this, but not build more settlements, dismantle existing outposts and allow the Palestinians freedom of movement.” Biden’s call came as President Obama prepared for a private meeting with Israeli President Shimon Peres. Netanyahu has supported expanding Israeli settlements and has so far avoided any public endorsement of a Palestinian state. His comments have cast doubt on the future of the stalled Israel-Palestinian peace process. But Peres, whose post is largely ceremonial, told CNN on Monday that Netanyahu has agreed to follow the commitments of previous governments and suggested he was avoiding the reference to avoid friction with partners in his conservative coalition. “He has to keep them together. He must, like many politicians, do what [ex-U.S. Secretary of State Henry] Kissinger used to call constructive ambiguity,” Peres said. Is Obama Ready for a Hard-Right Israel?